ProStock Marine Extreme Welded Fender.18".dia. x 60" long, (46cm x 152cm). 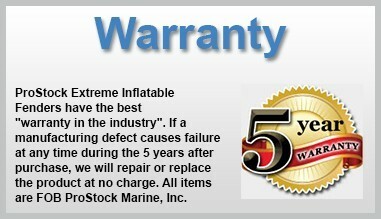 Prostock Marine Inflatable fenders carry a 5 year warranty. PF-7 Prostock Marine Inflatable Fenders are WELDED inside and out. Shipping is available call today for the best price.